I've been seeing lately a lot of giveaways using the Rafflecopter. I think using this service helps the contest host list the requirements to join the contest or giveaway clearer and neater. Also, it is easier to understand also for those who are joining the contest. Maybe if I host a contest someday, I might use this service also, if I get an invite to use them. Rafflecopter is right now an invite-only service. Both are open world wide. You only need to use your Facebook account or Google Friend Connect to join the giveaway and a Paypal account to claim your prize. Join now by clicking the buttons above. 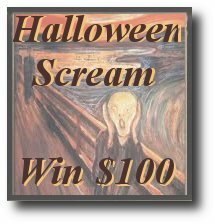 Blog, Blast Win $50 ends in October 25 while Halloween Scream Win $100 ends in October 30.